To see what is ahead for European unity, look at what is behind. On May 4, 2012, the Daily Express wrote one of the most shocking articles I have ever read. It was titled “EU Plot to Scrap Britain.” The article described Germany, Italy and France meeting privately to discuss a new form of leadership for the European Union. Britain was excluded from these discussions. This happened four years before the Brexit referendum. This small faction of European foreign ministers was informally called the “Berlin Group.” Its confidential discussions revolved around combining the presidencies of the European Council and the European Commission. These foreign ministers wanted to merge the two positions and create an EU superpresident, a monolithic position of absolute power greater than that of the president of the United States! The author of this article, Macer Hall, described the powers of such a European president this way: “Opponents fear the plan would create a modern-day equivalent of the European emperor envisaged by Napoleon Bonaparte or a return to the Holy Roman Empire of Charlemagne that dominated Europe in the Dark Ages” (emphasis mine throughout). The EU has yet to realize this plan. But keep watching Europe—you can expect it to happen soon! Many Europeans continue to hope for just such an individual. Napoleon ruled 200 years ago. Charlemagne ruled 1,200 years ago. Today, most people romanticize and glorify the reigns of these two European emperors. But they forget the bloodshed. They forget the violence these European rulers brought about. They blot out that bloody, bloody history. It is much more difficult to forget about Adolf Hitler. His Nazi death machine sparked a world war and murdered by the millions. His horrific rule is much more recent. In many ways, he committed some of the worst atrocities in human history—and it happened during the lifetimes of many of us. These facts are well known, and Hitler is still reviled today. What is less well known is that Adolf Hitler was a leader of the Holy Roman Empire, just like Napoleon and Charlemagne! Adolf Hitler came in the spirit of Charlemagne! Germany’s World War ii empire was even named the Third Reich—it was a resurrection of an empire that had existed before. The Second Reich was the German Empire from 1871 to 1919. And what was the First Reich? The Holy Roman Empire ruled by Charlemagne! Europe is now looking to revive that same spirit—the same spirit Hitler had revived. European leaders see problems in Europe, and they want to establish order in Europe once again by creating a new Charlemagne. The Berlin Group, officially known as the Future of Europe Group, knew that one of the European Union’s most prominent member states would totally reject this plan. So, even though it meant insulting and opposing an important fellow member of the EU, they excluded Britain. For decades, Britain has stood against the idea of an undemocratic bureaucrat receiving Charlemagne-like powers. It has restrained Europe from replacing democracy with an empire. Britain was forced into a no-win situation. If it remained in the EU, it would have to accept less and less sovereignty, less democracy, more and more integration, and more power for EU leaders. If Britain did not conform to the idea of an EU superpresident, it would either be kicked out of the Union or choose to leave—which is exactly what British voters did in June. The Brexit referendum facilitated Europe’s plans to build an empire by removing one of its biggest obstacles. After Britain’s referendum to leave the European Union, the Daily Express published an article about a development in Europe that some have called an “ultimatum.” In the article “European Superstate to Be Unveiled: EU Nations ‘to Be Morphed Into One’ Post-Brexit,” Nick Gutteridge explained that political chiefs within Europe are taking advantage of Britain leaving the EU by revealing blueprints for a giant European superstate. He wrote, “Under the radical proposals, EU countries will lose the right to have their own army, criminal law, taxation system or central bank, with all those powers being transferred to Brussels” (June 28). This development has “sparked fury and panic in Poland,” the article said. Why would Poland be panicking? Could it have something to do with the fact that Poland was one of the first nations to experience the spirit of Charlemagne in World War ii? Poland has a bloody history in dealing with the spirit of Charlemagne! The Polish people know what a powerful Europe with Germany at the forefront means for civilization! The transfer of power to Brussels is really a monstrous deceit. The power is actually being transferred to Berlin. The whole European project is ultimately about Germany leading a united European army, economy and government. Virtually the whole world knows that fact, but no one wants to talk about it. Foreign ministers from France and Germany are the main architects behind this plan to unify Europe like we have never seen it unified in modern times. Germany has had a long-term plan to revive the Holy Roman Empire. At the end of World War ii—when the most recent resurrection of that empire was defeated—that plan was already in motion. In August 1944, German industrialists gathered for a meeting in Strasbourg, France, where they began planning for the future. (You can read the document detailing this meeting at theTrumpet.com/go/922). It was becoming clear that Germany would lose World War ii. These industrialists committed themselves to financing the Nazi Party underground. At a subsequent meeting, the German Armaments Ministry told representatives of Krupp, Rochling and Hecho, “Existing financial reserves in foreign countries must be placed at the disposal of the [Nazi] Party so that a strong German Empire can be created after the defeat.” The Allied communiqué that documented these meetings and their plans to hide funds, resources and even Nazi leaders in foreign countries using German industries was unknown to the world until it was declassified by the U.S. government—in 1996! This was a plan to resurrect not just the German Reich, but the Holy Roman Empire! The spirit of Charlemagne did brood over those men in a way you can’t imagine! They don’t know what the spirit of Charlemagne really is! When EU leaders say they want to revive the spirit of Charlemagne, they don’t fully know what that means! In fact, they don’t understand the spirit of Charlemagne even from a merely historical standpoint. If they understood even the history of his empire, they would be scared to death! 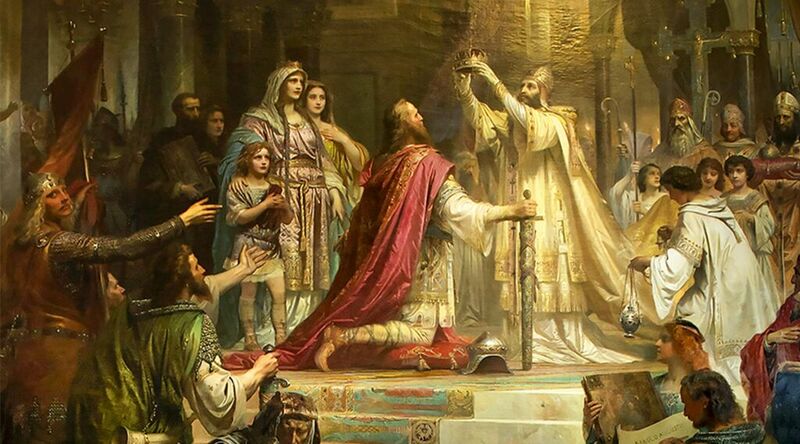 Pope Leo iii crowned Charlemagne (Charles the Great) emperor of the Holy Roman Empire on Dec. 25, a.d. 800. He is honored in history because he reestablished Western Europe for the first time after the fall of the Roman Empire 300 years earlier. But what was his reign like? It was continuous war! It was a bloody empire unlike any that came before it. Charlemagne spilled rivers of human blood, slaying Lombards, Moors and other Muslims, Bretons, Bavarians, Benventians, Slavs, Croats, Byzantines, Bohemians and Danes. But perhaps his cruelest campaign was against the Saxons, which spanned 30 years of continuous war. Throughout his reign, Charlemagne executed many thousands of Saxons because they refused to be baptized into the Catholic faith. They refused to convert to Catholicism and to submit to the rule of Charlemagne and the pope, so he killed them. Charlemagne’s philosophy was: Convert to Catholic rule, or be executed in the bloodiest fashion. That is the spirit of Charlemagne. Violence of this level hadn’t been seen in years! Even Charlemagne’s own advisers questioned his methods. But nothing could stop him! That uncontrolled drive for violence is the spirit of Charlemagne. It’s not something adventurous and romantic; it is disastrous, a spirit of mass hatred and murder! Why was Charlemagne’s rule so exceedingly bloody? He was led by a different mind. This is an astounding verse from the Holy Bible. Along with many other verses in Revelation 13, Revelation 17, Daniel 7 and elsewhere, the Bible describes the Holy Roman Empire and its resurrections. As astounding as it might seem, the Bible described this empire in detail centuries and even millennia before those details occurred. Now those details are facts of history! The wounded beast described in Revelation 13 is the Roman Empire. The wound was inflicted in a.d. 476 when barbarians invaded Italy and sacked Rome. The wound was healed in a.d. 554 in the Imperial Restoration, which resuscitated the empire and established the Holy Roman Empire. This history lines up precisely with what the Bible describes. The Bible also describes this Holy Roman Empire being defeated and then re-resurrected another six times—for a total of seven resurrections. Six of these are now a matter of history: They were led by Justinian, then Charlemagne, then Otto the Great, then the Habsburg Dynasty, then Napoleon, then Hitler. All of these resurrections came from the same spirit. What spirit is it? Is it the Spirit of God, as they claimed? The Bible foretells that one more resurrection of this empire is ahead of us. And events in Europe are dovetailing with that prophecy very closely! Western Europe, a supposed modern bastion of democracy and secularism, is about to once again become a unified empire led by a strongman and influenced by the Catholic Church! And what spirit will that leader have? The same spirit embraced by Hitler, by Napoleon, by Charlemagne. If you want to know what spirit leads the Holy Roman Empire, look to the same source that—as a fact of history—accurately forecasted its six resurrections over a period of many centuries. That source is the Bible, and it says that this ferocious, constantly reviving, beastly, potently religious power is led by “the dragon” (Revelation 13:2-11). The facts of history show that this has been true time after time after time over the past 1,400 years. Each of these empires has been an unholy union between the Vatican and worldly European rulers and their armies. Each of these empires has spilled rivers of blood in the name of God. Each of these has been a false religion and a bloody iteration of an evil empire. The spirit of this empire is the spirit of Satan the devil! Many people reject the Bible and reject the existence of the devil. But compare what the Bible says to the documented facts of history and ask yourself, Was the Bible right? And if so, could it be right about the existence of the devil? Could it be right that he will lead one more empire to come? Prove the truth for yourself. And closely watch the spirit of Charlemagne.